DOG DAYS IN THE CITY Cover Reveal: Author and Illustrator Q&A + a Book Giveaway! Josie Shilling loves animals. She helps care for her family’s golden retriever, Sugar, and even used to have a pet pig named Hamlet. When her family gets too chaotic, volunteering at the local animal clinic is the one place Josie truly feels like herself. But then a mysterious box appears on the clinic’s front steps, and Josie suddenly finds herself in charge of a litter of adorable, mischievous puppies! There’s no way her parents will let her keep them. So Josie has two weeks to find them a forever home. But finding one home for Hamlet was hard enough—and now she needs seven! On top of that, Sugar is getting older, Josie’s family is fighting more than ever, and being twelve isn’t all it’s cracked up to be. This summer will bring unexpected changes for Josie, as she learns about growing up, letting go, and loving your pack no matter what. DOG DAYS IN THE CITY is the sequel to my middle grade debut with HarperCollins Children’s Books, THE UNLIKELY STORY OF A PIG IN THE CITY, and it publishes on 10/2/18 (If you’re interested, you can pre-order it now and add it to your Goodreads shelf!). I’m thrilled to be here on Watch. Connect. Read today (thank you, Mr. Schu!) sharing the cover of DOG DAYS IN THE CITY for the first time and my recent interview with Pascal Campion, the incredibly talented illustrator for both my books. We’re also offering readers a giveaway opportunity for a hardback copy of THE UNLIKELY STORY OF A PIG IN THE CITY at the end of this post! Pascal Campion is a prolific French-American illustrator and animator from the San Francisco whose clients include: DreamWorks Animation, Paramount Pictures, Disney Feature, Disney Toons, Cartoon Network, Hulu, and PBS. Working in the animation industry for over 15 years, currently he is the Art Director for the Netflix/Warner Bros “Green Eggs and Ham” series. His feature work includes Visual Development of “Mr. Peabody and Sherman” and “The Penguins of Madagascar.” Pascal also has worked with Marvel Comics since 2013 and has steadily posted many thousands of images of personal work to his “Sketches of the Day” project since 2005. Visit http://www.pascalcampion.com to shop prints + follow on social media. JK: Hi Pascal! Thank you so much for doing this interview and cover reveal of DOG DAYS IN THE CITY with me today. It’s truly an honor to have worked with you on two books now. We’re all excited to learn more about your artistic process for covers… So, can you tell readers a bit about the early stages of designing the DOG DAYS IN THE CITY cover with David Curtis Studio and HarperCollins Children’s Books? PC: To be totally honest, David approached me with a few different scenarios about what could be a good idea for the cover. All of them included her [Josie] being seen from the back. I did a few round of sketches (which were super fun to do), and we ended up all liking the park bench idea. Then I started playing around with what the dogs could do and that was just pure pleasure. JK: I love how that perspective mirrors the first book, too – Seeing our main character Josie from the back and her strong bond with animals. With DOG DAYS IN THE CITY, how did you approach the staging of the characters on the cover – Josie, Sugar, the seven puppies, and Hamlet the pig? PC: Hamlet wasn’t supposed to be in there at first. The initial layout didn’t have her so when we realized we wanted to have a call back to the first cover, I had to rearrange the composition to make her fit. I think it works pretty well though. The dogs… that was fun. I did a ton of little sketches of dogs running around, and I just tried to create a circle round the bench to get a sense of motion and let the be fun and playful in their own little spaces. JK: One of the things I love so much about the DOG DAYS cover is the puppies’ playfulness and energy – You captured them so perfectly. I know you draw a lot of cats in your personal sketches, so did this cover require any particular research to invoke the lively personalities of these little dogs? PC: Ha. I used to be an animator before doing illustration work and one of my very first animation was of a dog running after a butterfly in a field. I always loved drawing dogs in motion. I like drawing cats standing or sleeping, but for motion I love drawing dogs. I had to do some research to know specifically how these dogs looked for their patterns, ears and muzzles, but for the actions, I was just having fun. JK: Can you share how you used lighting, environment, and color palette to create the mood and emotion? PC: I love lighting. All my images are usually based on story and lighting and specifically how lighting can change or reinforce your perception of a scene. In DOG DAYS IN THE CITY, I wanted something bright but with enough shadows to create a sense of mystery… that’s what I was going for at least. I wanted it to be fun but with still some unknown. My initial pass had darker shadows but we made them a little lighter for printing and readability. JK: What tools/media did you use to sketch and color book covers? PC: For this cover it was all Photoshop. I did the initial sketches and final rendering/color pass in Photoshop. 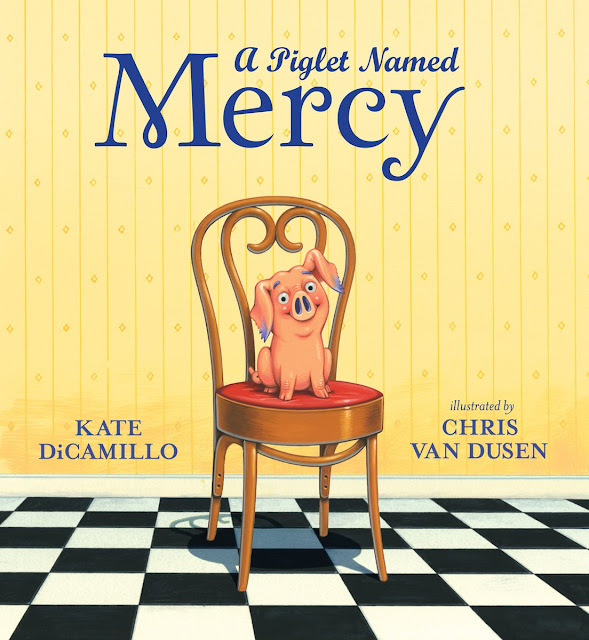 JK: This sequel is a summer story, as compared to the cozy/wintery tale of THE UNLIKELY STORY OF A PIG IN THE CITY. Were there any specific artistic challenges/considerations with creating two unique/different covers that also have an overall complimentary quality to them? PC: Oddly enough, no. I think your writing is so clear and your ideas so strong that you’ve already created a world that is easy for me to picture. I just did another book cover that took over a dozen passes to find the right idea because neither myself or the editor could find a way to represent the world. Your world is so appealing to me that I can just jump right in. JK: Wow – thank you for that. I’m curious, do you have any favorite elements to the book covers in particular, from the front to the back to the spine? I’m obsessed with the adorable little puppy and piglet on the spines. And there are so many wonderful, thoughtful visual details that readers will connect with the stories… from the Tuxedo Pigeon feather on Josie’s desk and gymnastics leotards (THE UNLIKELY STORY OF A PIG IN THE CITY cover) to Sugar the golden retriever resting next to the bench and the puppies’ bright red collars on DOG DAYS IN THE CITY. I love both of the covers so much. PC: Well… the covers were a lot of fun to work on, and I loved drawing all the details on the first cover, but for the second book it was just the puppies. I did a bunch of puppy drawings for the inside of the book and I had so much fun that I actually drew way too many. We had to chose and discard some. That was a real treat for me. JK: Alright, let’s do a few lightning round questions! Favorite animal to draw? PC: Octopus (my son loves monsters, so when I do drawings for him I always put tentacles in there. They make me laugh and he loves them). Close second… cats then dogs then birds. JK: Early bird or night owl? JK. Same here. Love that early morning quiet time. Any current artistic inspirations? PC: Hiking, biking, hanging out with the family. JK: TV show you could binge-watch all day? PC: Hmmm…. don’t know. I like Stranger things. JK: We’re obsessed with Stranger Things! Best part about living in LA? PC: Being so incredibly close to everything, from amazing hikes in the mountains, to the beach to biking paths, to schools for the kids, and the animation studios where I spend A lot of time. JK: Favorite things to do with the family? PC: I would say hiking, but they would probably not agree on that being the best thing. Hugging is probably what they would say. JK: Hugging – That is precious. Thank you so much again Pascal for interviewing with me today and the gorgeous book covers! Thank you Mr. Schu for hosting us here today! 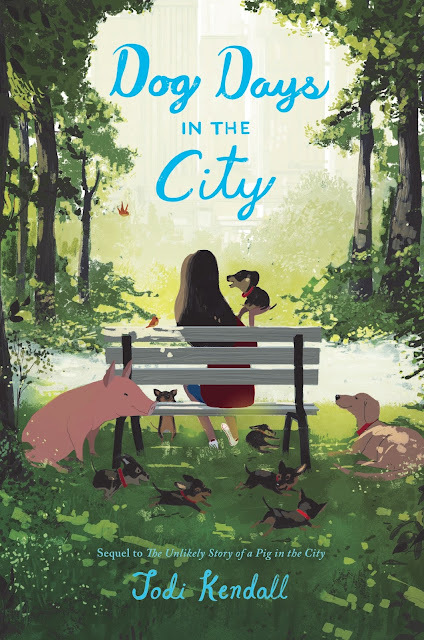 To celebrate the cover reveal of DOG DAYS IN THE CITY (pubs 10/2/18) on Mr. Schu’s blog, we’re giving away a hardback copy of THE UNLIKELY STORY OF A PIG IN THE CITY to one of Mr. Schu’s lucky USA/Canada readers! 1. It will run from 2/7 to 11:59 PM CST on 2/9. 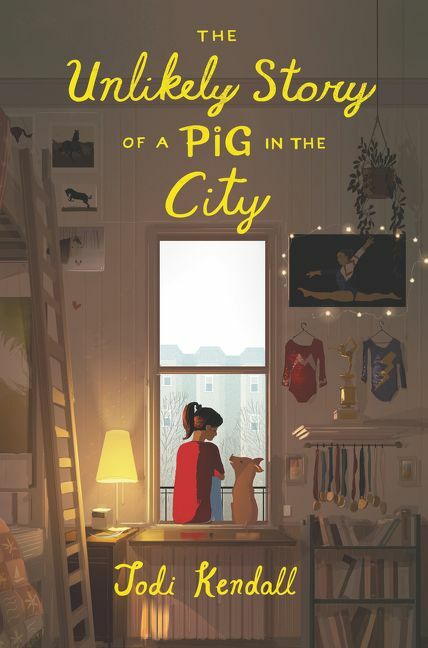 Jodi Kendall's debut middle grade novel is THE UNLIKELY STORY OF A PIG IN THE CITY (HarperCollins Children’s Books). The sequel, DOG DAYS IN THE CITY, publishes on 10/2/18. 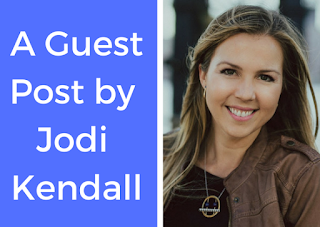 As a freelance writer, Jodi’s clients have included The National Geographic Channel, Nat Geo Wild, and numerous digital and print media outlets. She’s traveled around the world to study animals and is a passionate citizen scientist, vegan, environmentalist, and wildlife warrior. She holds an MFA from the University of Arizona, is an active member of SCBWI, and lives in New York City. 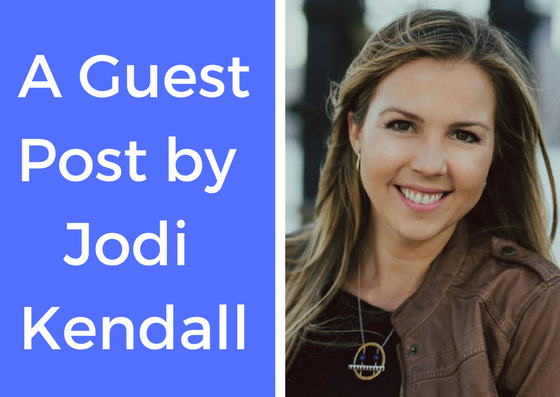 Visit www.jodikendall.com for more info + follow on social media. 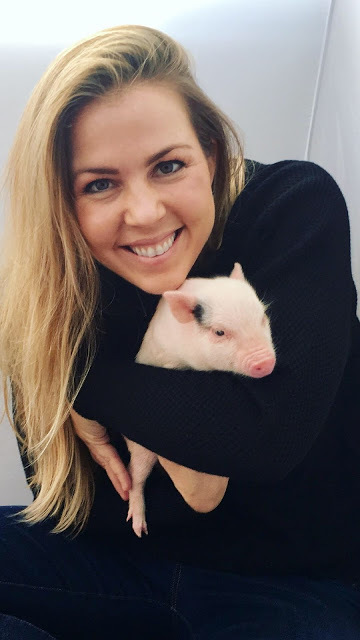 Love The Unlikely Story of a Pig in the City! So looking forward to Dog Days in the City!